Beards? What are reasons men suddenly grow a beard? A guy I slightly know grew a beard, another friend of his posted that he had a reason for it and made it like it was some big deal. Nobody I know knows what she is talking about and she is being "mysterious" about it. Nobody can ask him because he is currently unavailable online/text for a few weeks while he and his band go on a small tour. He still shaves his head everyday so it isn't about not wanting to shave. And he isn't a sports fan, so not about a sports team or tradition. I'm mostly just confused why the one friend is acting like it is a big mystery. I'm too busy admiring my teeth in the morning. Just because it made me laugh and nobody but that guy can actually answer me. Thoughts on geometric jewelry? Should a girl wear a crop top if she has a chubby belly bulging over her jeans? Which pair of shoes should I get? Did Anybody Else Receive The Physical Assets They Wanted Through Puberty? How Much Of It? I'm a new American so sorry for the stupid question, but when should you stop wearing thermal underwear? They're also trying to reclaim the mustache. It's the media that associated mustaches with creepy pedophiles. I find the association ridiculous. Maybe some guys, but this guy is hot no matter what. With, without, scruffy. Either way I do find that most guys look better with beards/goatees/facial hair you know assuming that the facial hair they have works with their facial structure. Didn't even notice it in your answer. I know my brother, when he used to play American Football, during playing season refused to shave his beard, because it would be bad luck. Cause it (hopefully!) looks good. And it kinda feels good too. Whatever that means. Because shaving them is frankly a ball ache.. thats the main reason. She most likely was the one that asked him to grow the beard, and he is doing it for her. Possible, but she is his best friends wife. Maybe that is why she wants to keep the reason a secret. Home > Fashion & Beauty > Beards? 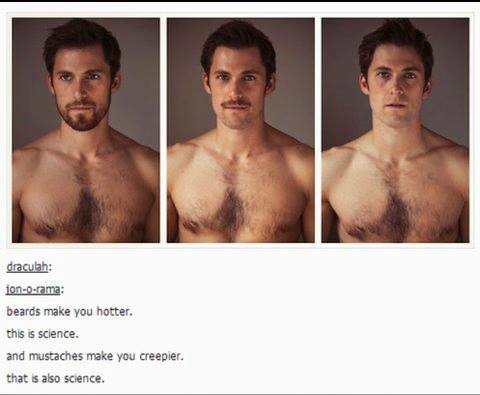 What are reasons men suddenly grow a beard?